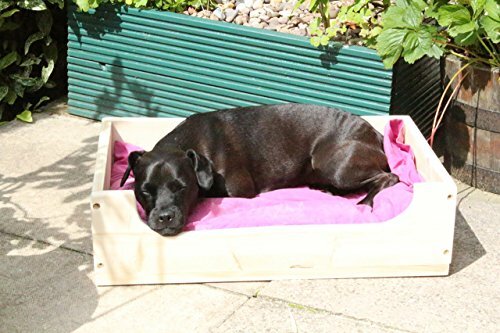 Handmade dog beds and in general bespoke items for pets are all the rage these days. 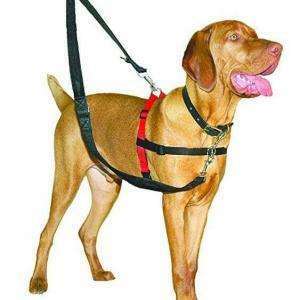 Whether it be beautifully dog harnesses or breed specific toys – more and more households are creating spaces just for their dogs. This brings us onto handmade dog beds – beautifully crafted and often uniquely wonderful – these make the perfect addition to your home. As part of our new “At Home” section, we select our eight favourite choices out there. Each is different and many are suited to a particular size of a dog, but we believe we’ve selected something for everyone. Remember these beds are handmade so some may have to be built from scratch, so allow time for construction. 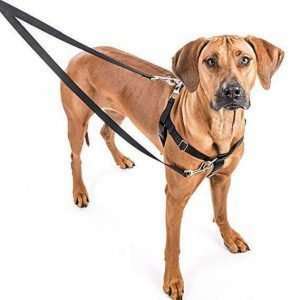 Always check the descriptions as some may take longer than others and some can be customised to your / your dog’s needs. 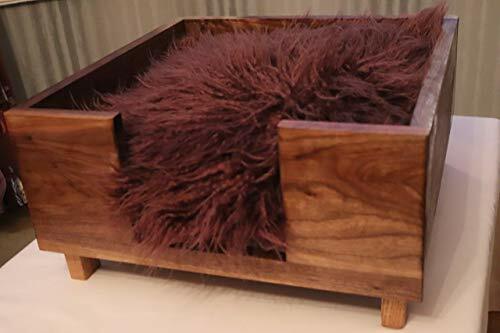 Enjoy, and remember to let us know your handmade dog bed success stories in the comment section or on our Facebook page. Pictures, of course, are particularly welcome! UK by WineBoxesEtc. The base of this bed is made from reclaimed French wooden wine boxes. These boxes once carried fine wines around the world – primarily the Bordeaux region of France. The frames are fully sanded down including corners and edges which removes any splinters, The wine box is then covered in a clear lacquer varnish to keep the crate smooth and protect it from water damage and the elements. Four bun feet have been placed at the bottom to raise the dog bed off the floor. 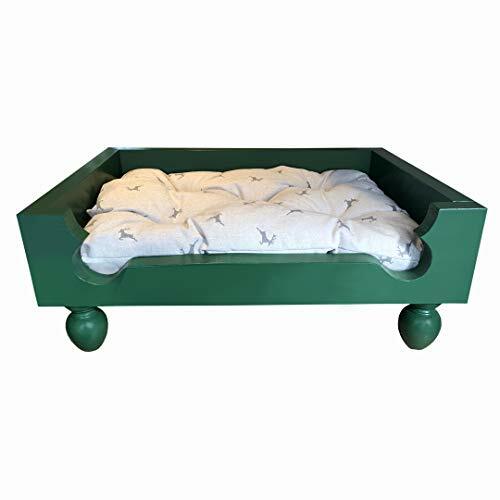 This pine made bed is designed for the smaller breed of dog, be it your pug or border terrier. Unlike the previous dog bed, this one is raised above the ground. The dog uses the ramp to get up to the bed. The standard measurements are 25 inches long (63.5cm) 21 inches high (53.5cm) 16 inches wide (41cm) including a ramp. This is a custom build so there is some flexibility on sizing but like anything handmade, make sure you specify clearly before ordering. This is certainly a unique type of dog bed, raised up and using a ramp. 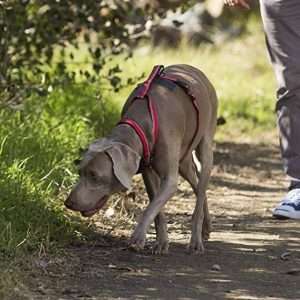 We suspect that it’ll take some training for your dog to get used to it, but that’s no bad thing. Remember this is for small breeds – so if your highland terrier shares the house with a great Dane, this may not be for you. 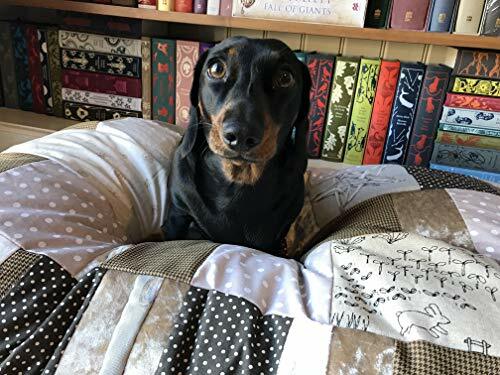 Okay, this handmade dog bed is the ultimate in cute with each being specially made in Scotland by ShhhSistersSecrets, two sisters in Fife. Each can be made in one of four sizes; X-Small – 18″x18″, Small – 24″x24″, Medium – 26″x38″, or Large – 38″x58″. These can be used as dog beds by themselves or in combination with another wooden frame if required. The materials are fire resistant and the top cover can be removed for washing either cover or inner pillow. Material is a combination of cool cotton for the patchwork outer layer and cosy fleece for the inner. There’s a number of designs available, and as they’re handmade, you can request and discuss patterns and colours with the creators. This is a lovely addition to any home and the various sizes mean you can find something perfect for your dog. Manchester-based Chunky Funky make functional and beautiful items from reclaimed and salvaged products. 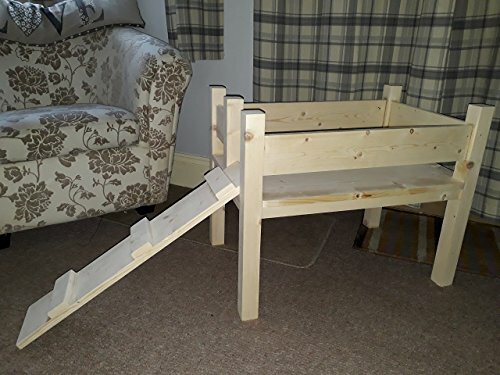 The design of this beautifully constructed item came from the creators Patterdale Terrier “Missy”. “Missy” our Patterdale Terrier gave me the idea as if she couldn’t be seen she would be found in the bed lying on my pillow. It’s a gorgeous piece and each is made by hand from ecological, responsibly sourced, reclaimed off cut timber. Any standard sized pillow can be added to this bed and replaced as the owner sees fit. It’s customisable and can be bespoke made depending on your requirements. It’s great to see this type of love going into a dog bed, and you should definitely check this out. Designed for smaller breeds, this bed is made from Walnut hardwood although you can discuss larger sizes with the creator. Made in Walsall, UK – this frame is sized to fit a standard cushion approx 400mm square. In addition to the walnut frame, oak legs are included at the bottom to raise it slightly from the floor. Get in touch with the creator for your specifications, but this looks like a solid and long lasting dog bed that your dog will call home. 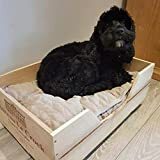 Designed by The Bark Dog Beds this wooden bed measures 84cm width x 64cm depth and is made with slatted bottom and a dog bone cutout detail. Wooden feet are added to the base to raise the bed from the ground. The bed is then hand painted in a choice of sixteen colours. The cushion fabric comes in a choice of sixteen colours; Green Velvet, Pink Velvet, Blue Velvet, Red Velvet, Stag, Natural Dots, Grey Dots, Stars, Light Grey Teddy, Dark Grey Teddy, Brown Teddy, Cream teddy, Yellow Check, Dark Grey, Light Grey or Blue Check. 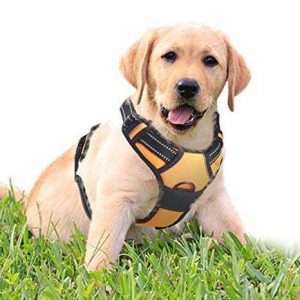 It’s a little unclear of sizings, unfortunately – though we believe they cater for all sizes of dogs, it may be best to get in touch first before purchase. Something special here for our next item from Bulgarian reclaimed wine barrel company, Barrelio. 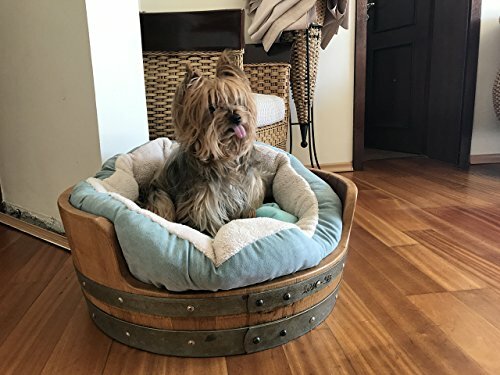 This is very cool and a great use of a barrel.We’d imagine this would suit smaller breeds, though you could always discuss measurements with the creators. The barrels are made from solid oak. They utilise red wine barrels to give them that distinctive colour. Before being turned into a dog bed, each barrel is given two to three months stacked on a stillage which allows moisture content of the oak to reach furniture-making levels. The hoops are then removed, the staves refurbished and finally, the barrel rebuilt into its unique design. This design is certainly one of a kind and will make a unique addition to your home. 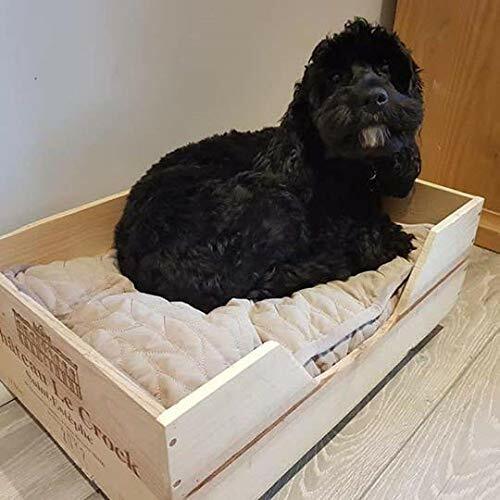 This luxury dog bed, made to order, is created from quality crushed velvet in North Wales. It can be made in three sizes. The small dog size has an inner cushion 20ins x 20ins and is recommended for breeds such as Pomeranian and Yorkshire Terriers. 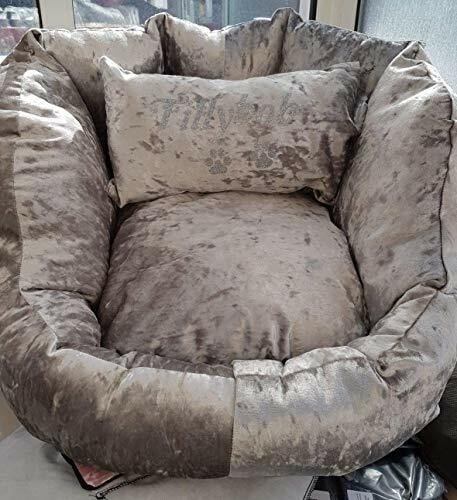 The medium size has an inner cushion dimension of 25ins x 25ins for small breeds such as french bulldogs, Shitzu and Pugs. Finally the large has an inner cushion size of 30ins x 30is and is recommended for larger breeds such as Staffies. The bed is so soft and comfy with no trim that could be chewed off. The item arrived within the timescale and well packaged. I’m so glad we found this as the name on the cushion is an extra special touch. So if you’re looking to bathe your puppy or smaller breed dogs in comfort of soft velvet – this may be exactly what you’re looking for. 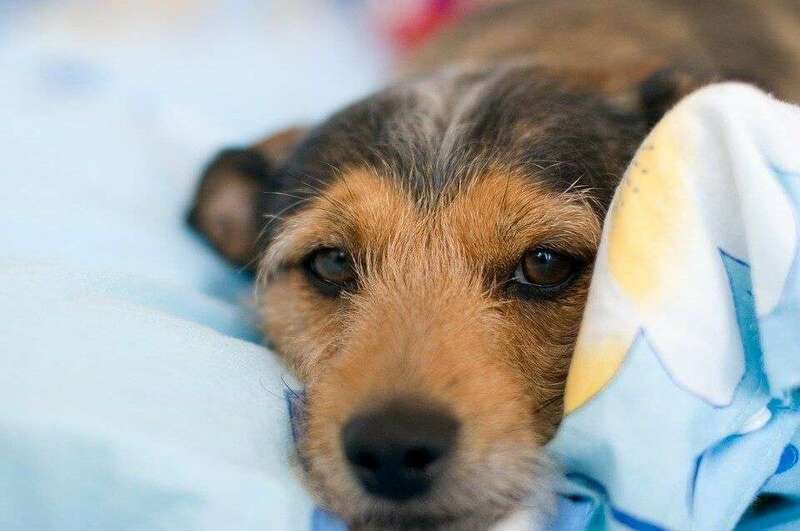 We hope you’ve enjoyed our handpicked selection of custom dog beds. There are some very unique designs here which we think both you and your dogs will be thrilled with. Remember if you have one of these or other suggestions, please let us know or post your pictures on our Facebook page. Sweet dreams!